If you feel you're ready, then it's time to put those cards to good use, so let's get started! 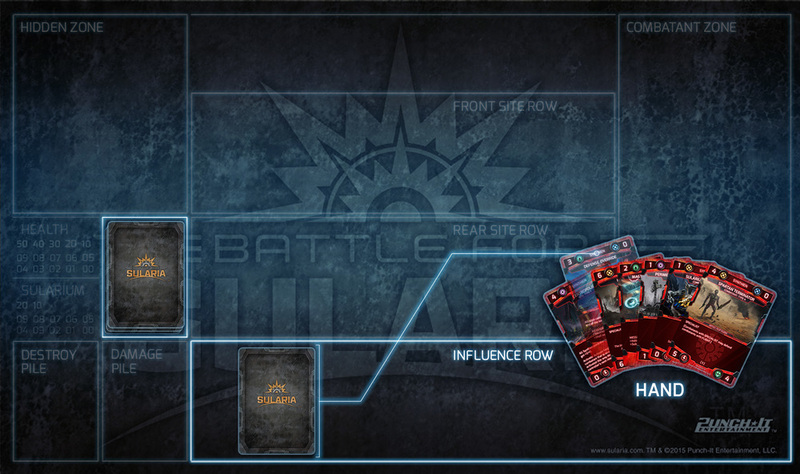 The game zones: Hidden, Combatant, Site Rows, Influence Row, Damage, Destroy, and Play Deck areas. Seasoned card players will notice many familiar game zones in the Battle for Sularia, in addition to some very exciting new ones. If you're a new player, learning the game is easy with our intuitive layout and sequence of play. Let's run through an example first turn and see how the action unfolds! A starting hand is seven cards and you draw two cards per turn after the first! In our example above, we've placed a deck in its play area, drawn a starting hand of seven cards, and set our starting life total to 25; which means we're ready to begin our first turn. Each turn begins with the Reset Phase, when you reset (turn a card to a vertical or ready position) any activated cards (those rotated to a horizontal or exhausted position) you control. This represents your forces recouping or resting after a sortie, or systems recharging at a site after being depleted. Next is the Draw Phase, after each player's first turn, they will draw two cards from their play deck and put them into their hand. Since it's still the first turn for us, both the player on initiative (first player) and the player off initiative (second player) skip drawing. Keep in mind that we are representing our hand above as visible, but when you're playing be sure to keep yours hidden from your opponent! Below your play deck is the Damage Pile and Destroy Pile, places for cards that have been discarded or removed from the game respectively. When combatants and sites are "killed" in combat and have had their defense value reduced to zero they are placed in the damage pile. While out of play, they're not out of the action yet! Certain effects can utilize cards in the damage pile, but once they reach the destroy pile they're gone for good! Reset, then draw... next in the turn order is the influence phase. Each turn you may take up to one card from you hand and place it into the Influence Row face down. Each card placed into the influence row will produce one point of influence each turn and increase your threshold of influence by one. As we discussed last time, influence is used to play sites, and threshold allows us to play tactics and conditions. Keep in mind that any card may be placed face down into the influence row, however, tactics and conditions are the best cards to place there. But why? That's because when a site or combatant is played from the influence row it will leave and go to its appropriate zone (site row or combatant/hidden zone) and detract from your influence generation and threshold. Tactics and conditions played from the influence row will be used and then continue to remain there, giving you points of influence and threshold value for subsequent turns. A tactic or condition played this way will be turned face up to represent that it has been used, and in the case of conditions, are an active card in play (tactics generate one-use effects when played, conditions generate a continuous effect when played and while face up). That doesn't mean a tactic or condition can't be played from your hand. Once you meet its threshold requirement, either card may be played from your hand. However, upon resolving, it will be placed into the damage pile and any effects it generates will last only to the end of the turn. That means you'll get no influence generation, threshold, or continuous effects from tactic or condition cards! Obviously, it's better to play them from the influence row, but when the situation demands it, from the hand is a good last resort and can even have some very flexible tactical applications. With that said, let's put the tactic card Defense Override into the influence row! After we place a card from our hand into our influence row, we generate influence equal to the number of cards in the influence row; in the example above that would be 1. Next we move to our Site Phase where we will begin to build our domain and get a head-start on generating some sularium. Following the example above, we are spending our 1-point of influence to establish a Perimeter Alert System from our hand. We know it costs one influence because of the number one next to its purple influence cost icon in the upper left-hand corner. Furthermore, if the Perimeter Alert System was in our influence row, we could turn it face up and establish it in the same way, but we'd lose out of a point of influence next turn and our threshold would be back to zero! Not optimal, but in a pinch, using the influence row to play sites is a very workable solution. When establishing a site we choose to place it in either the Rear or Front Site Rows. This has real game play implications as an attacker cannot attack a site with another site in-front of it. We're going to establish our lowly Perimeter Alert System in the rear row, so that we might protect it in the future with a more defensible site like Centropolis, which has a higher defense value of 7 compared to 3. How you structure your defenses will be essential to your survival in the battle to come, so choose wisely! Mine sularium and deploy combatants. After the site phase is the Sularium Phase, where we'll generate sularium equal to the total number indicated in the upper right-hand corner of our face up cards in play. Currently we have one sularium from the Perimeter Alert System, which is just enough to deploy a Sularium Excavator. The next phase, the Combatant Phase is when we'll deploy our Sularium Excavator. Just like before, we can play combatants from our influence row or hand, and like sites, it's best to deploy them from our hand, so let's take that Sularium Excavator and put it into the Combatant Zone. We're putting it into the combatant zone instead of the Hidden Zone because it doesn't have the Hidden special ability keyword. Combatants in the hidden or combatant zones function essentially the same except that those in the hidden zone cannot be targeted by your opponents! Another item to note is that combatants deploy activated, so that they may not attack, defend, or use activation abilities the turn they are played. We'll have to wait until next turn before we can use our Sularium Excavator in combat! Turn four of our hypothetical game, which started with a simple Perimeter Alert System. In only three more turns look at what we've been able to accomplish! You can see a tactic and a condition in the influence row, which have been turned face up to gain their effect after their threshold of two was met; doing up to three damage with Feedback and boosting sularium production with Master Mining Program - along with two other face down cards. Thanks to the program and powerful sites like Centropolis and Prototype Development Base we've been able to power out 7 sularium generation on our fourth turn (8 -1 for Assault Synthiod's maintenance) and amass ten points of attack! A Jotune player would be lucky to have half that by now, and with a Spartan Terminator and a Hydra Reaver on the way, things are only going to get more dire for our opponents. We also have a Hades Sularium Crawler joining the fray in the hidden zone, ready to lend its stealthy defensive capabilities, and since its hidden, it can't be the target of any nasty tricks by our adversaries. Note that a System Scramble is in the damage pile; notable, because this means that it was played directly from the hand instead of the influence row. Now that you've studied all three introductory game play articles, you're ready to get your hands on a copy of Battle for Sularia and start playing! Be sure to head to our store and order and copy today, and check out our in-depth turn and how to play tutorials for an even closer look at the intricacies of the game! The battle's beginning, what side will you choose? !